I love the ways that art intersects with technology, math, science and nature. I have spoken on this subject at galleries, schools and universities, conferences, and public events such as TEDx Orlando, Creative Tech Week NYC, Pecha Kucha and Nerd Nite. I can adjust my presentation to fit your audience, whether it’s made up of artists, programmers, the general public, or children. If you would like me to speak at your event, please contact me. 2016 · Algorithmic Art. Creative Tech Week 2016. Brooklyn, NY. 2016 · Mathematics, Music, and Visual Art. With Dmitri Tymoczko. St. Jerome’s University. Waterloo, Ontario Canada. 2015 · Artist Talk: Michael Forrest and Nathan Selikoff. UCF Center for Emerging Media. Orlando, FL. 2015 · I Give You Permission. TEDxOrlando 2015. Winter Garden, FL. 2015 · Making Maps. Maker Faire Orlando 2015. Orlando, FL. 2014 · Champions of Craft. Vespr Craft Coffee & Allures. Orlando, FL. 2014 · Rethinking the City via Digital Mapmaking. Rethinking the City. Orlando, FL. 2014 · Processing Orlando: Art, Gadgets, and Tech. Orlando Tech Week. Orlando, FL. 2014 · Technological Telekinesis: Become One with the Force. Orlando Maker Faire. Orlando, FL. 2014 · Digital Arts Salon. Coral Springs Museum of Art, Coral Springs, FL. 2014 · Art & Algorithms. Palm Beach State College, Palm Beach Gardens, FL. 2014 · Art & Algorithms. University of Central Florida, Orlando, FL. 2014 · Gallery Talks for Taking Flight. Snap! Space, Orlando, FL. 2014 · Career Day. Orangewood Christian School, Orlando, FL. 2013 · Art, Chaos and Computation. Brooklyn Technical High School, Brooklyn, NY. 2013 · Art and Algorithms. Saint Ann’s School, Brooklyn, NY. 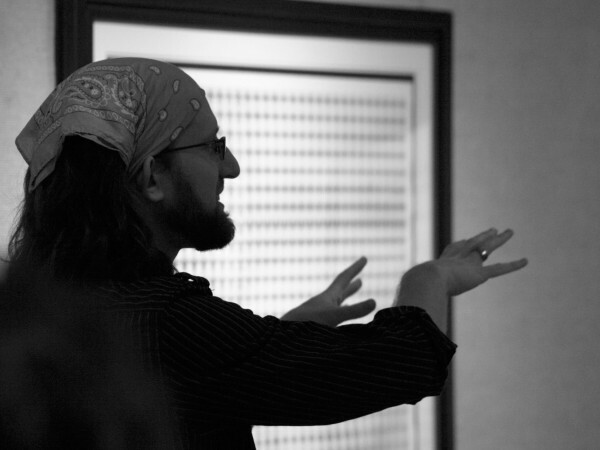 2013 Gallery Talks for Students and Panel Discussion on Digital Art. Art & Algorithms Festival. Titusville, FL. 2013 · Technological Telekinesis: Become One with the Force. Nerd Nite Orlando #3. Stardust, Orlando, FL. 2012 · Chaos and Computation. Young Architects Forum: Next 4. Theatre Downtown, Orlando, FL. 2012 · Chaos and Computation. Leaders in Software and Art. Private Residence, New York, NY. 2011 · Chaos and Computation. PechaKucha Orlando v4. Blank Space Gallery, Orlando, FL. 2011 · The Confluence of Chaos and Computation in Generative Visual Art. Palm Beach State College, Palm Beach Gardens, FL. 2010 · The Confluence of Chaos and Computation in Generative Visual Art. AMS Sectional Meeting. Special Session on Mathematics and the Arts. University of Richmond, Richmond, VA.
2009 · Aesthetic Explorations of Algorithmic Space. DIMACS Workshop on Algorithmic Mathematical Art: Special Cases and Their Applications. Rutgers University, Piscataway, NJ. 2009 · The Beauty and Potential of Mathematics. Daytona State College, Deland Campus, Deland, FL. 2008 · Strange Attractors. Orange County Public Schools, Orlando, FL. 2006 · Digital Chronophotography. SIGGRAPH 2006 Sketches Program, Boston, MA. 2004 · Digital Art. Seminole County Public Schools, Casselberry, FL. What a 1,000-mile bicycle tour does to a marriage: my wife Amy Selikoff and I, both individual presenters at past PechaKucha Nights in Orlando, Florida, teamed up for the first time on May 19th, 2013 to tell how we road tested our relationship!